Sunset World Resorts & Vacation experiences announces the date for its traditional Christmas event in Cancún. 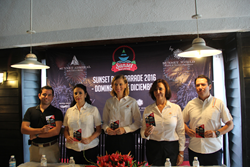 Everything is ready for the 5th edition of Sunset Boat Parade which will take place on December 18th, jointly with the Manos Mágicas program, with more than seven thousand people expected to attend, according to the information received this morning in a press conference. Annie Arroyo, Corporate Brand and Communication Director for Sunset World Resorts & Vacation Experiences, emphasized that year after year there has been a growing amount of boats joining the event and more families gather by Canal Sigfrido to enjoy the parade. “One of our objectives is to strengthen family and social bonds through events such as the Boat Parade which entire families can experience and share the joy,” Mrs. Arroyo explained. According to the organizers, at least 30 boats are expected to participate in the parade which will take place in Nichupté lagoon and the sea. Martha Rodríguez, Director of Financial Development for Benito Juárez municipality, also in charge of the Manos Mágicas program, stated that the alliance that has been established with Sunset World has been very successful with a very positive response from the community. In addition, Mónica Roberts, Corporate Director of Operations for Sunset World disclosed that several activities have been planned including collecting toys from those attending the event which will then be donated to children with cancer, as well as a firework display which will be seen from everywhere in the hotel zone . Ricardo Muleiro López, chairman of Cancun´s Nautical Association explained that 25 boats participated in the parade last year and the number is expected to grow to 30 for this edition. The registration is still open to the public and the only requirement is for the boat to be decked out with Christmas decorations. Ismael Durán, Sunset Admiral Yacht Club & Marina’s Manager of Operations, explained that, according to the program, the boats will set sail at 6:00 pm from Sunset Admiral Yacht Club & Marina, passing through Canal Sigfrido in front of Jardín del Arte and cross the Calinda bridge to go out into the sea where the parade will skirt along the coast and then come back following the same route.